Bruce Hettema writes, "When I purchased [San Fransisco art studio Patterson & Hall], I discovered an old file cabinet containing the agencies scrap files going back to the 1920′s. 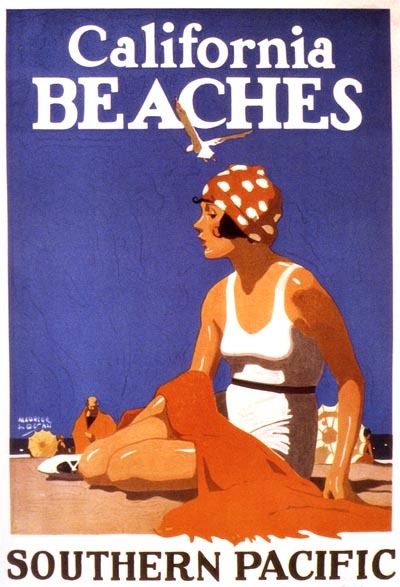 The files contained reference photos taken for the staff illustrators, advertisements, and samples of illustrators the agency admired. Over the coming weeks I will post these samples at the P&H Creative blog, along with some bio info and my commentary." "There are 2 sides of Maurice Logan," writes Bruce. "The illustrator, and the fine artist. What I like about his work is his ability to, at times, combine these 2 worlds. You can often see in his commercial work the loose, impressionistic brush stroke of a fine artist and his non-commercial work shows what a keen an eye for design and composition he had." 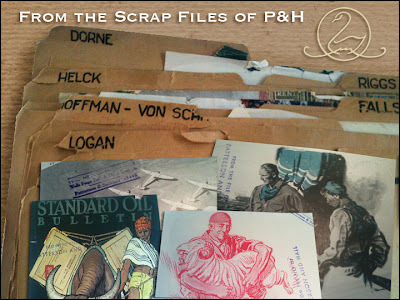 * I'll be sure to let readers know when Bruce updates the P&H Scrap Files! 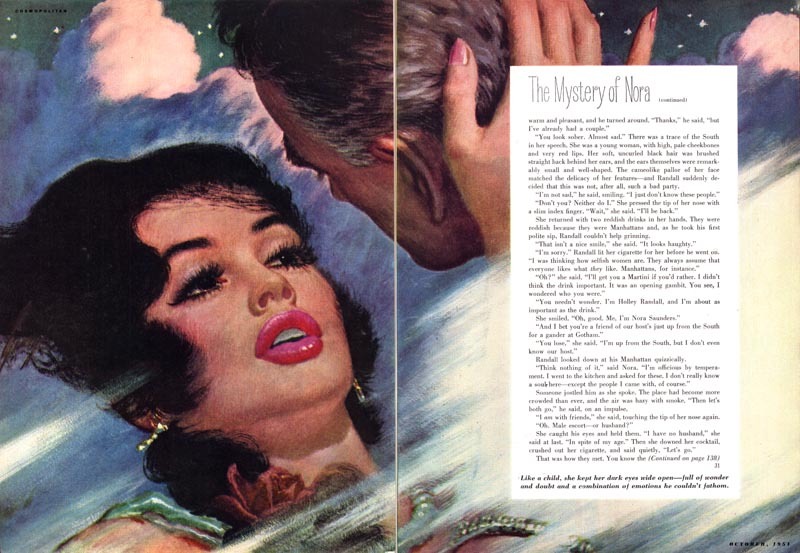 Chadwick Crawford writes, "I found a couple of Edwin Georgi images at a vintage magazine shop and scanned them today. I posted them to my blog which nobody reads." That's a shame, because Chadwick has a bunch of great mid-century illustrations posted, including some terrific paper back cover art. Chadwick offered to send me his Georgi scans - but I have so many of my own (like the one above) I decided I'd encourage you instead to visit Chadwick's blog and enjoy his scans there. Rick Friedman sends a quick note: "Check out the new updates!" And you really should - there is so much spectacular artwork on Marvin Friedman's website... Marvin's "Current Works" section alone is beyond belief. Gorgeous, sensitive observational artwork that is at once visceral... and magical. Evandro Rocha writes, "Would you consider writing a post on a Brazilian artist? There is an artist I am a fan of and I would be very pleased if you could do a post on the work of '70s artist, Joseph Lanzellotti. Unfortunately I have no knowledge of this artist or examples of his work. But readers might enjoy visiting Evandro's blog, where they'll see a couple of pieces by Lanzellotti (and hopefully there will be more to come in the future). Enrique Flores writes, "Greeting from Spain! 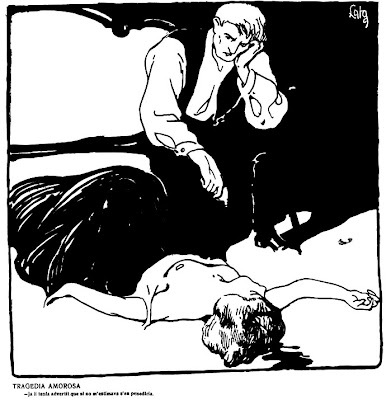 I've been posting some stuff about unknown spanish ilustrators (Bagaría, Lata) that might interest you. You'll find it here"
A reminder that each week the NCS blog features a 'spotlight' on one of its members, culled from the archives of Today's Inspiration. This week its Hank Ketcham's turn in the spotlight. Drop by the blog for some neat, rarely seen spot cartoons by the creator of Dennis the Menace. And speaking of Ketcham, here's an obscure cartoon spot. This was sent to me by the owner of the original who wrote, "My father was an Illustrator all of his life. He was in the Navy working on ships as a signalman during WWII. It was during a visit of an officer that he was recognized for his artistic ability. The Navy transferred my father to work in Washington D.C. to draw and sketch. It was in D.C. that my father met Hank Ketchum, Also working for the Navy." "Long story short, they both drew. Although my father never became famous, he supported and raised all five of us children through his talent as an illustrator and a draftsman. My father stayed in touch with Hank on occasion. Hank sent my father a cartoon unlike any I have ever seen. 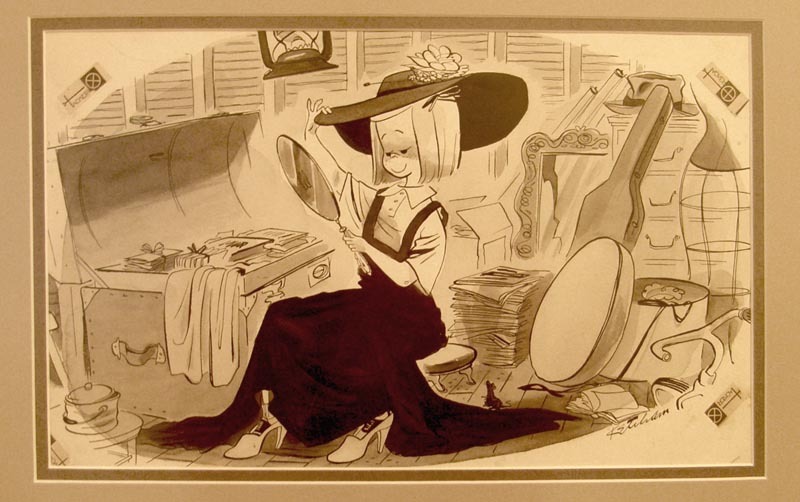 It is of a small girl in an attic playing "dress-up" with the items from an old chest. It could be an idea that never came to pass. If you could help me identify a time period for this cartoon it would help me greatly." I forwarded the note and the scan to Marcus Hamilton, who draws the Dennis daily panel. Marcus replied, "That’s a great illustration by Hank. And an interesting email from [the owner] regarding his father’s association with Hank in the Navy. I sent the image to Dottie in our home office and to Ron, our Sunday artist, and neither knew a date nor publication that the art was created for. 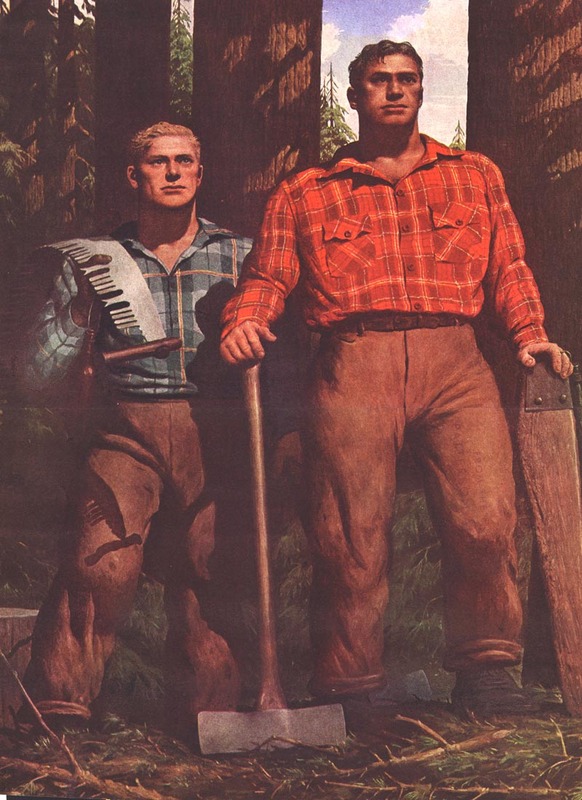 It looks like one of his spot illustrations for either Saturday Evening Post, or Colliers, both of which were regular clients of his during his freelance days in the late ‘40s, prior to Dennis in 1951. That’s our best guess." Thanks Marcus! The Dennis the Menace panels remained amazing long after the gags had gone stale. I didn't know anything about Hank Ketchum's career aside from the strip. Thanks! I am so into art. I haven't read Ur post but some of these pics remind me of Andy Warhole works. thank you for the post. This really is very meaningful to me. Publicize the work of José Lanzellotti, a Brazilian artist orignal! I think your research work great!